Ta upar sultan hai, mat chuke Chauhan. This couplet was narrated by the poet Chandbardai to Prithviraj Chauhan, telling him the exact position where Muhammad Ghori is seated. Based on a folklore, Prithviraj set his arrow at an angle suggested by Chandbardai and shot Ghori in his throat and before anyone could capture them, the poet and Rajput king stabbed each other. Though there are no historical facts for this episode, it is nonetheless a popular story in Rajputana and has been recorded in many ways. Image of Prithviraj Chauhan can be cited elsewhere in this catalogue and is styled after the imaginary portrait of Maharana Pratap, which includes features of an ideal Rajput warrior. 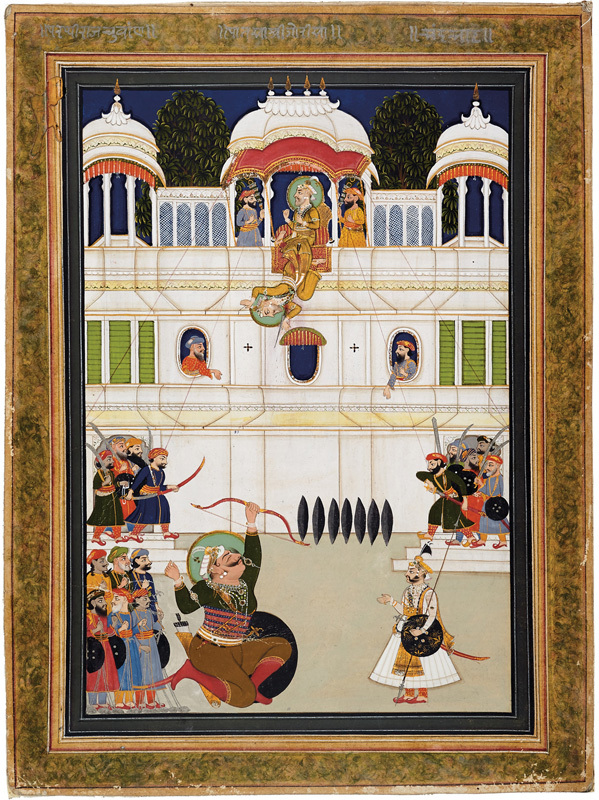 In an animated narration, Muhammad Ghori is painted twice, where in second depiction he is shown falling out of the jharokha after being shot. Artist follows the style and schematisation of famous artist Tara and his son Shivalal of Mewar.